One of my favourite beauty brands has to be Clarins. My mum had Clarins and Guinot in her beauty salon years ago before anyone in Ireland really knew about the products and I have grown up with a love for them. Often people say that Clarins is for older ladies with more mature skin and I would have to disagree. Now don’t get me wrong all of their products are not suitable for 20-something year olds but once you find what suits your skin you wont look back. I have a few staple Clarins products that I always use so I will post these in a future post about skincare. 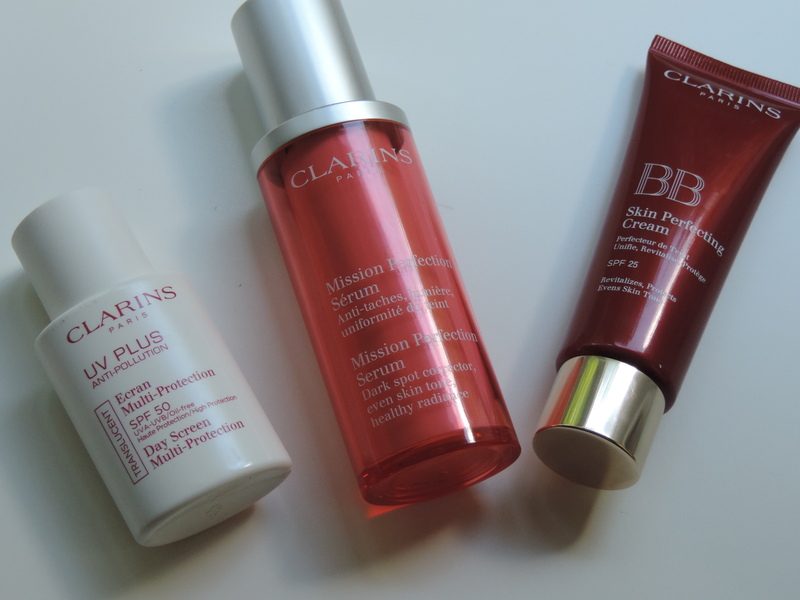 Today’s post is all about Clarins new product that is ‘Mission Perfection Serum’. I was kindly invited to the press launch of this product and it did not disappoint. I knew straight away from the feel of this product that it was going to be in my beauty favourites pile. Clarins have made a breakthrough discovery concerning the role of cell messengers, called exosomes, in the process of pigmentation. Messengers which, subject to aggressions (UVrays, inflammation), send out the “wrong” messages which cause pigmentation disorder. This new discovery forms the basis of a completely new dark spot correcting solution: a serum whose formula is capable of restoring the “right” messages to ensure perfectly even, luminous skin and reveal the full beauty of your natural skin tone. Clarins have revealed that the melanocyte is not exclusively responsible for pigmentation disorders, but also the 36 keratinocytes that interact with it. These 36 “enemies” of an even complexion send out the “wrong” messages via exosomes, which then cause pigmentation disorders. Dark spots, dyschromia, shadowy areas, acne marks, a dull complexion and redness appear on the skin surface. The complexion is no longer flawlessly beautiful, regardless of skin tone. This is something that I suffer from but only mildly. On my cheeks and around my nose I have broken capillaries and red dots. I am not sure what these are from so my aim for using the Clarins Mission Perfection Serum was to reduce the appearance of these. 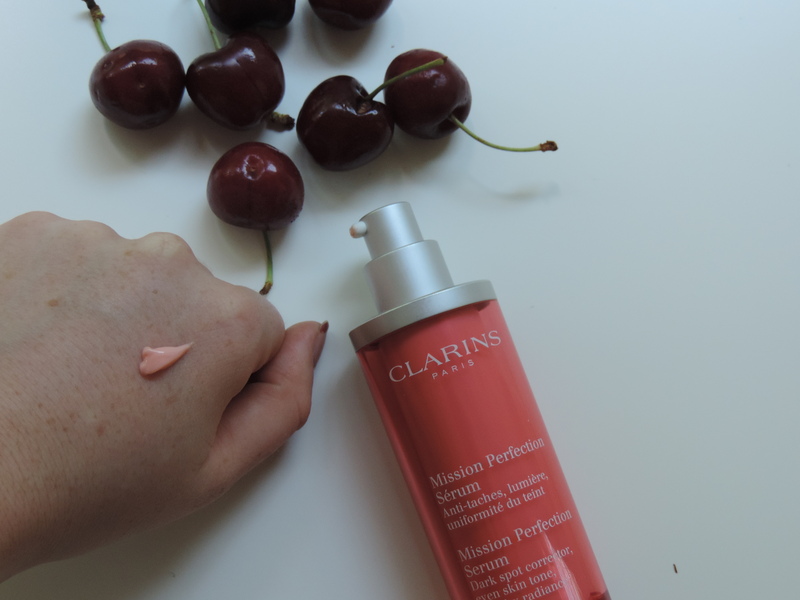 The Clarins ‘Mission Perfection Serum’ is a dark spot corrector which will even your skin tone without altering your natural skin tone and restore beautiful radiance skin. It is suitable for women of all ages. This product works differently for women in their 20’s compared to women in their 50’s but all will see results. So does it work? – YES it does! Now as a 20- something year old I have different needs for this Clarins product than say my mum (who also loves the product). So why do I need this product. I lead a busy hectic lifestyle which means I need to look after my skin. Trust me I can notice when I miss a week of face masques or forget a certain product when I stay at a friends house. I believe that looking after your skin in your 20’s will help you in latter years. My mum always thought me this and she looks incredible without makeup so I think I will listen to her. I am all about a product that will make my skin brighter and luminous. The ingredients Clarins use in this product is what makes it stand out from all others on the market. 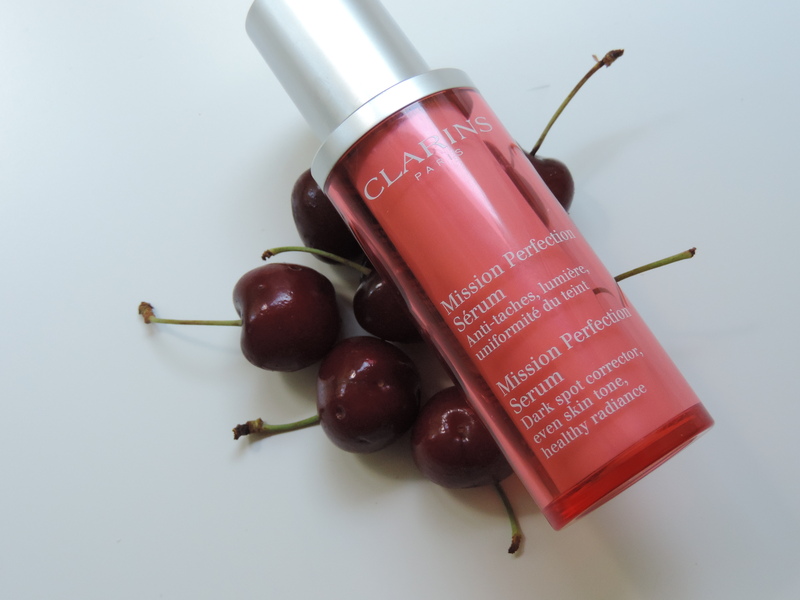 Clarins Mission Perfection Serum’s formula, combining the best of plants and science, is capable of restoring the “right” messages to ensure perfectly even, luminous skin while respecting natural skin tone. 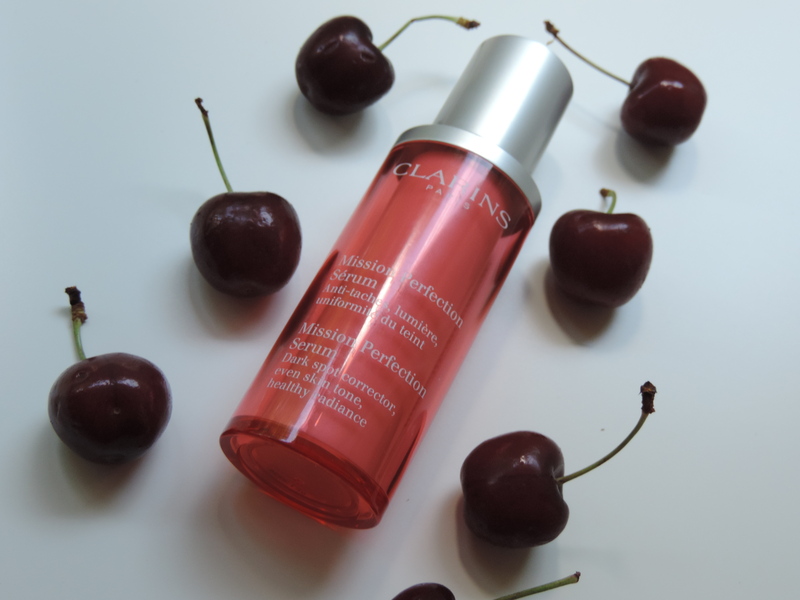 Acerola extract (Cherry): A Clarins discovery, this powerful plant extract has the ability to block the “wrong” messages which cause pigmentation disorders. The acerola (Cherry) plant had an incredibly high content of vitamin C, making it the ideal food supplement to treat fatigue or winter ills. Studies carried out in Clarins Cell Biology Laboratory have demonstrated the capacity of acerola extract to reduce the overproduction of melanin. Hexylresorcinol: This leading dark spot correcting molecule helps reduce the formation of dark spots at their source. At the heart of the skin, ginkgo biloba extract helps to restore luminosity. Ginkgo biloba leaves are used in the medical field as a venous tonic and in cosmetics they have demonstrated their capacity to help protect skin microcirculation. On the skin surface, gentle fruit acids reduce the look of pigmentation marks and smooth skin texture to optimize reflection of the light. Use it with Clarins UV PLUS ANTI-POLLUTION SPF 50, for enhanced results and reinforced protection from dark spots. This product is incredible. I have spoken briefly about this Clarins product in a previous post (here) and I adore it. The texture is so light, your skin will thank you for using it. It is not a suncream per say, but it helps with everyday pollution that your skin is exposed to. Exclusively available at Brown Thomas from 6th – 20th July 2015. Posted in Beauty, Skin CareTagged Brown Thomas, Clarins, Clarins Mission Perfection Serum, Exclusive to Brown Thomas, French Skincare Brand, New Clairns Product, SkincareBookmark the permalink.